Ted could teach a master class on how to live well in retirement without a huge budget. At 70, he has been retired and living in a mild climate for nearly five years. He has been divorced since the early 2000s, but he's in a committed relationship with a widow who lives nearby. His adult daughter is a big part of his life, too. "We're very close, and I'm delighted that she is willing to talk to me about her career, relationships, and finances," Ted wrote. Retirement has given Ted the time to rediscover one of his life's passions: photography. He studied photography as an undergrad and snapped pictures throughout the world as he and his then-wife traveled extensively early in their marriage. While Ted's career was in marketing, he managed to sell his photographs on the side to augment their income. Now that he's retired, he has even more time for photography and has begun sharing his trove of travel photographs online. "Having discovered Instagram I've also started shooting again, and that has resulted in increased travel," he wrote. Orthopedic problems forced Ted to quit his lifelong running habit recently, but he still loves biking. He and his partner also enjoy good food and entertaining friends. While Ted's nest egg is comfortable, it's definitely not huge; his portfolio currently weighs in at just about $450,000. He owns his condo and takes advantage of all property tax breaks available to seniors in his municipality. He recently splurged on a small SUV, but notes with pride that he got a good deal on a 2018 model and expects to keep it for many years. While he recently took his first required minimum distributions from his tax-deferred accounts, he was able to reinvest a healthy share of those withdrawals back into his taxable portfolio because Social Security covers most of his living expenses. "I'm not a big spender but also don't worry too much about spending," he wrote. That said, Ted has a few concerns about his portfolio and his finances. First and foremost, his parents both lived into their 90s, and Ted is concerned about outliving his assets. He has long maintained a conservatively positioned portfolio, preferring capital preservation and modest growth potential over a more volatile, stock-heavy mix. Yet he worries that forsaking growth exacerbates the risk of outliving his money. While Ted is frugal and has a long-term care insurance policy, he has recently found his expenses ticking up a bit in a few areas--namely, out-of-pocket drug costs as well as dental expenses. Ted holds his portfolio in three silos. The bulk of his assets are in a traditional IRA, but he also holds smaller Roth IRA and taxable (nonretirement) accounts. His overall asset allocation is indeed conservative: He holds about two thirds of his assets in cash and bonds and the remaining one third in stocks. The complexion of his equity portfolio is also fairly conservative: It skews toward high-quality large-cap U.S. stocks and underweights smaller-cap, growth, and foreign stocks, which can be more volatile. Ted holds a number of first-rate mutual funds, both active and passive, all from Vanguard; most earn Gold or Silver ratings from Morningstar's analyst team. Investing with Vanguard helps keep a lid on his investment-related expenses: Morningstar's X-ray reveals his asset-weighted expense ratio is just 0.13% per year, versus 0.99% for a similarly weighted portfolio of mutual funds with average expense ratios. 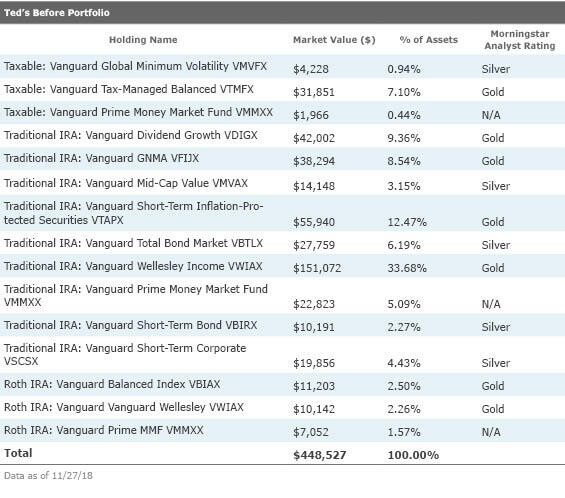 Ted's largest position, in his traditional IRA, is the Gold-rated Vanguard Wellesley Income (VWIAX), which features just over a third of its assets in stocks and the remainder in bonds. 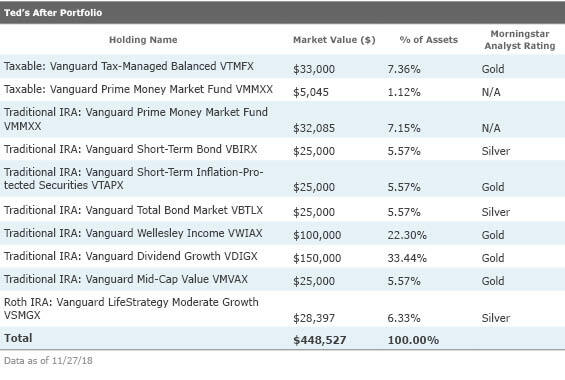 Vanguard Dividend Growth (VDIGX), which is closed to new investors, is his largest equity holding. Because of its focus on companies that a history of dividend growth, it tends to perform relatively well in down markets. As stocks have tumbled over the past few months, it has managed to hold up much better than its peers. Ted's bond portfolio is similarly high quality and conservative. His largest holding is Vanguard Short-Term Inflation-Protected Securities (VTAPX); as a short-term TIPS fund, it manages to protect against credit and interest-rate risk, as well as inflation shocks. He also holds Total Bond Market Index (VBTLX), a short-term bond index fund, a GNMA-focused fund, and a short-term corporate bond fund. In addition, he holds a healthy allocation to cash. The key gauge of the health of a financial plan is spending rate, and from this standpoint, Ted's program is in excellent shape. He says Social Security supplies about 90% of his living expenses. And while his RMD totaled $15,000 this year, he spent just $6,300 and reinvested the rest in his taxable account. That translates into a withdrawal rate of just 1.4%. Ted's plan is in solid shape, so the changes in the "After" portfolio amount to fine-tuning rather than a major overhaul. I targeted a slightly higher overall equity weighting of just about 50% of assets, in an effort to preserve Ted's purchasing power and nudge up its long-term growth potential without running into extreme volatility. However, it makes sense for Ted to dollar-cost average into a larger equity weighting, given that equities still aren’t particularly cheap. Because Ted's traditional IRA will supply all of his withdrawals (and then some) through his required minimum distributions, I like the idea of employing a bucket strategy for this part of his portfolio. That way, Ted can withdraw from the cash holdings to meet his RMDs, then periodically refill the cash bucket with income distributions, rebalancing proceeds, or a combination of the two. Happily, most of Ted's existing IRA holdings lend themselves well to that approach. I enlarged the cash bucket slightly to allow for the next two years' worth of withdrawals, and targeted another 10 years' worth of withdrawals in bonds, both from the dedicated bond funds as well as Vanguard Wellesley Income. That’s a higher bond allocation than I've used in my model bucket portfolios, but seems reasonable given Ted's low risk appetite and modest spending rate. I jettisoned Ted's dedicated GNMA and corporate bond exposure; while Vanguard GNMA (VFIJX) and Short-Term Corporate (VSCSX) are fine funds, they duplicate exposure found in Total Bond Market and Short-Term Bond (VBIRX). Vanguard Dividend Growth and Vanguard Mid-Cap Value (VMVAX) round out Bucket 3. I enlarged both positions to facilitate easier rebalancing between the portfolio's aggressive stock and more conservative bond holdings. Ted's IRA account lacks direct exposure to foreign stocks, but Vanguard Wellesley Income tends to hold a stake overseas. And in any case, Ted's risk aversion means he doesn't need the wild card of foreign-currency fluctuations buffeting around his balance, especially in the account he's spending from. An alternate option for Ted's traditional IRA holdings would be to use a portion of that account to purchase an income annuity, which would provide a baseline of regular cash flows in line with Ted's withdrawal plans. For example, steering $100,000 to an immediate annuity would deliver more than $8,000 in annual income for the remainder of Ted's life, according to Schwab's Income Annuity Estimator. Adding a 10- or 20-year term certain option, which means the annuity pays out to beneficiaries for that time even if the annuitant dies shortly after purchasing, helps ensure a benefit for his daughter, partner, or other heirs while reducing his benefit only modestly. An annuity would nicely address that Ted is risk-averse and his main worry is outliving his assets. To help ensure he's thinking through all of the key considerations before purchasing an annuity, I'd recommend Ted consult with a fee-only, hourly financial advisor to get an arm's-length opinion on whether such a product makes sense in his situation. The portion of the IRA that wasn't used to purchase an annuity would still be subject to RMDs, but the RMDs would be reduced accordingly. Alternatively, Ted could consider a deferred income annuity, which would pay out a later date--for example, at age 85. Either strategy could help ensure a stream of lifetime income and hedge against longevity. Because Ted's taxable account is a rather small piece of his portfolio and he doesn't expect to spend from it on an ongoing basis, my bias is to keep things simple. This account makes sense as can serve a receptacle for his emergency fund, which belongs in cash. And I'm a big fan of Vanguard Tax-Managed Balanced, which supplies tax-efficient exposure to stocks and municipal bonds. Because Ted's in a low tax bracket, he could also consider a less tax-efficient but potentially higher-returning all-in-one taxable option such as Vanguard LifeStrategy Moderate Growth (VSMGX) or even Vanguard Wellington (VWENX). Ted will obviously want to evaluate the tax costs before making any changes to this portion of the portfolio. If he can stay in the 0% tax bracket for capital gains, selling out of Vanguard Global Minimum Volatility (VMVFX) won’t entail any tax costs. It makes sense that Ted's Roth IRA would be the most aggressively positioned of his accounts. Given the fact that his RMDs provide everything he needs for living expenses and then some, and that the taxable holdings would serve as next-line reserves in a pinch, the Roth assets would be last in his withdrawal queue. Ted's Roth account is also the most tax-efficient of his holdings, and it's also an ideal account to leave for his daughter or other heirs. Vanguard Balanced (VBIAX) is a worthy option here, but I have a slight preference for Vanguard LifeStrategy Moderate Growth for this slot. As a fund of index funds, it includes some international equity and bond exposure, which add diversification. Finally, Ted is arguably underspending, even in light of his long life expectancy and moderate asset allocation. I love to hear that he's able to achieve such a satisfying quality of life on a modest withdrawal, but my bias would be for him to not deny himself periodic splurges--on travel, for example--even if it means a higher withdrawal rate in some years.